Mainly for use in storefronts and tradeshows, banners with stands are great because they're a very affordable way to display your brand. They set up quickly, within minutes in most cases, and can be re-used. 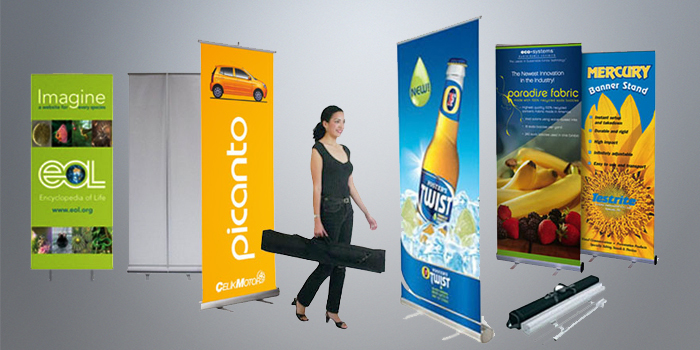 In storefronts, vinyl banners with stands can be cycled throughout the year to promote specific products at various time periods. You may be familiar with department stores that display banners for Thanksgiving, Christmas, and New Years at the respective time. We call that a one time investment for a perpetual profit! Our innovative retractable banner displays and large format printing services are perfect for trade shows, lobbies, exhibits, and point-of-sale displays. Size 33" x 80"24" x 60"96" x 96"